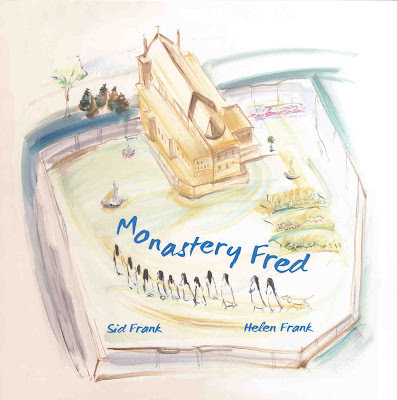 First there was The Nuns' Garden and now we introduce Monastery Fred! Our dear friend, Helen Franks loved being greeted by our dog Fred on her visits. She was saddened as we were when we had to put him to sleep due to illness. However, already up her artistic sleeves was the beginnings of a new book, Monastery Fred, a little dog a bit bored in a monastery who manages to get out when the cloister gate is left open. What he finds makes him realize that the nuns’ life isn’t so boring after all! It is a wonderful story for children from 3-93! Perfect for storytelling time! This summer Helen and her husband, Sid, celebrated with us in the parlor when the first copies arrived. In over 50 years of marriage this is the first time that Helen and Sid collaborated on a book! Sid wrote the story on the urgings (nagging?) of Helen who needed a story for her delightful illustrations. Sid is a lyricist who wrote the lyrics for songs for Frank Sinatra and Perry Como. We hope you will enjoy this delightful little book as much as we do. It surely will make a great Christmas gift. We are also grateful to Sid Helen for donating 50% of the proceeds to the monastery! Sid reads his story about Monastery Fred while Helen shows the appropriate illustration. One of the Sisters shows us a page from the book. Of course, we had to have cake and other good things! It was a party after all!